I confess that I wasn't especially excited for Stephen Thompson versus Johny Hendricks because it seemed as though Thompson was another opponent whom Hendricks could, should and probably would take down early and lay all over. Instead we were treated to one of the first major upsets of 2016 and the coming of age of a new contender in the welterweight division. Stephen Thompson karate'd all over Hendricks and stopped him in the first round. Certainly a statement as UFC welterweight champion, Robbie Lawler went ten hard rounds with Hendricks across two fights. That would be decently impressive if Hendricks had tried to 'stand and bang' with Thompson (which I'm sure many are already claiming), but just as in Holly Holm's victory over Ronda Rousey it was the execution of a perfect gameplan built around denying the opponent their A-game, yet showed the ability to stall or fight off that A-game in moments where the gameplan itself fell short. Inside of the first minute, Hendricks repeated right hooks caught Thompson as he circled along the fence and allowed Hendricks to consolidate his ring cutting, pressing Thompson into the fence. Hendricks tried his damnedest to get Thompson down but Thompson kept posting an arm and lifting his hips out from underneath Hendricks. Thompson broke free, returned to the middle of the cage and life suddenly got considerably worse for Henricks. The difference between top quality karate work—the in and out point style, not the in your face Kyokushin-variant style—is in governing distance. Like Lyoto Machida, you will notice that Thompson keeps a gulf of distance between himself and his opponent. The enormous benefit of this is that any offensive action is considerably more telegraphed. It's the same reason you don't want to stand close enough to be sucker punched by someone you're arguing with, space means time to react. And this gulfing distance serves to force what we term the 'extra step'. That is opponents, in knowing that they have this huge gap to close and that the karateka will retreat as soon as he sees forward movement, commits to two lunges forwards, a preliminary step and then the punch. And so the karate man has two choices, he can allow the aggressor to fall short and then counter before he returns to position—a delayed counter, go-no-sen—or he can read the forward movement and step in to intercept—a simulteneous counter or sen-no-sen. For more on The Three Initiatives, I suggest checking out the pertinent episode of our Ringcraft webseries. When Hendricks lunged and fell short, Thompson would punish him with that skip back rear straight. When Hendricks began plodding slowly forward, Thompson would bounce back, bounce back, bounce back and dive in a hard punch to Hendricks dome once the latter was following the pattern. The reverse punch to intercept the round kick was on full display seemingly every time Hendricks went to kick. It was clear to see that Thompson had the former champion's timing down. While Hendricks had success cutting the cage initially, Thompson made excellent use of a fairly substantial flaw in Hendricks striking. Hendricks comes in so side on, a la Dan Henderson, that even when he swings his lead arm out straight in right hooks, he has a very limited range of effective work as the opponent circles past his lead foot. Open Guard (southpaw versus orthodox) 101 is to get the outside angle on that lead foot because it provides such an easy escape. Hendricks steps so deep with his right foot, and stands so narrow that he concedes this position constantly, allowing Wonderboy to circle out along the fence fairly freely. The gap in experience at distance was obvious throughout the fight as Hendricks could not close the distance when he wanted to, but Thompson could do so almost effortlessly. This is made easier when the opponent is always moving forwards as Hendricks was. Where Lyoto Machida fights from this extra step distance, he does so often at a reach disadvantage. Being so gangly for his weightclass and brilliant at the rapid closing of distance, Thompson's side kicks might not be thrown that often but are a constant threat. Thompson also showed that old Bill Wallace principle of the chamber. Notice that the above side kick and round kick are picked up almost identically. It takes a good deal of dexterity, but arcing in tight round kicks that look like they are coming from a completely different direction is a tremendous means to pick up some easy, off-the-cuff knockouts. The use of high kicks to raise the guard into a braced position and fire down the center with punches, a timeless trick—nay, principle—was also effective throughout this bout. The finish came as Hendricks lunged in wild, with his head way ahead of his hips as he so often does, and was tagged with a straight. He backed onto the fence and Thompson flurried for the finish. As an interesting aside, I really like the body kick on the break in this gif, Thompson did this a couple of times through the fight and as his opponents are always so worried about getting their hands up as soon as distance is re-established, he can often sink a good boot into the ribs or gut. Some other fights happened this weekend, but none with anything on the level of Thompson's performance. 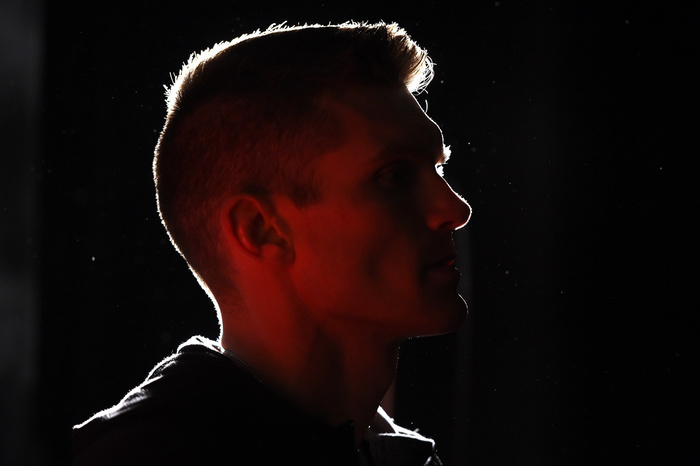 The welterweight division still mourns the retirement of Georges St. Pierre—and rumors of his return easily bait thousands of clicks every few weeks—but between Demian Maia and Stephen Thompson we have plenty to keep the champion busy in the coming months.